The colour is an important quality control parameter for eggs. It allows to determine the category of the eggs and eggproducts. The test is based on the photometric reading of the absorbance of the beta-carotene, a pigment naturally present in eggs. CDR FoodLab® simplifies and speeds up the traditionally used procedures enabling to perform many analyses, in few time and with small quantities of sample as is. The test is based on the photometric reading of the absorbance of the beta-carotene. 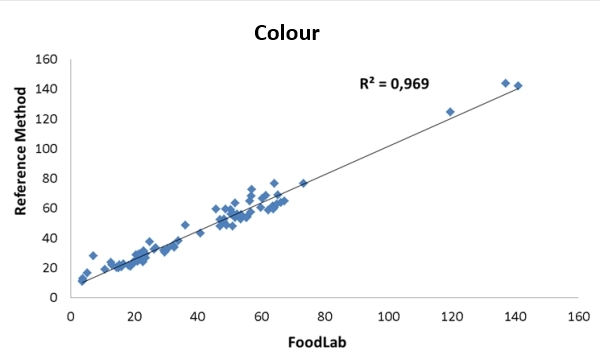 The method of CDR FoodLab® shows a very good correlation with the reference method. Codice *300295 suitable for 10 tests. Codice *300290 suitable for 10 tests. Codice *300795: suitable for 10 tests. Codice *300790: suitable for 100 tests. Egg Products: for yolk and mix collect the sample as is, without any treatment. Colour (Beta-Carotene) was last modified: December 30th, 2018 by CDR s.r.l.